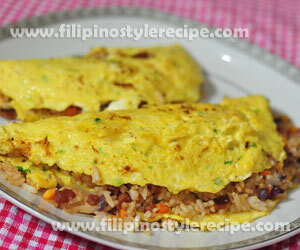 Filipino Style Recipe: longganisa rice omelet or omelette is another easy yet delicious breakfast recipe. This is another variety of omelet dish that consists of beaten eggs, and leftover longganisa(Filipino sausage) mixed and cooked with carrots and rice. This is a complete meal that usually serve during breakfast. 2. Chop carrots and longganisa into small pieces. Set aside. 1. In a pan, heat oil then saute onions until soft. 2. Add carrots and longganisa then stir cook for 3 minutes. 3. Add rice, soy sauce, salt and pepper then continue stirring for another 2 minutes. 2. Cook until slightly set then top rice mixture. 4. Drain and paper towel then transfer into serving plate then serve. 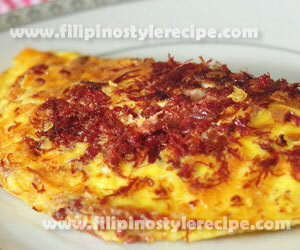 Filipino Style Recipe: corned beef omelet or omelette is another easy yet delicious breakfast recipe. 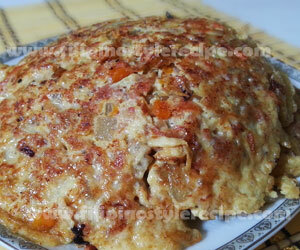 This is another variety of omelet dish that consists of beaten eggs, and corned beef then cooked until set. 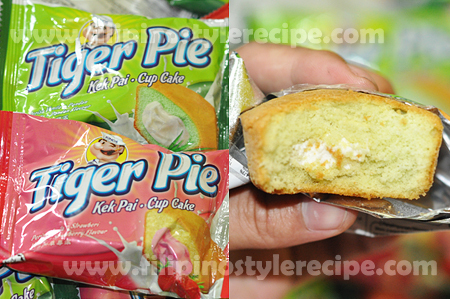 Then usually serve during breakfast with fried rice. 1. In a separate bowl, beat the eggs, milk and ground pepper together until frothy. Set aside. 1. In a nonstick pan, heat oil then saute onions until soft. 2. Add corned beef and cook for 3 minutes then transfer into bowl. Set aside. 3. Add half of corned beef into egg mixture then mix well. 2. Cook until slightly set then top the remaining corned beef and grated cheese. 3. Continue cooking until bottom is golden then gently fold omelet over. 4. Slide omelet into serving plate then serve with hot sauce. 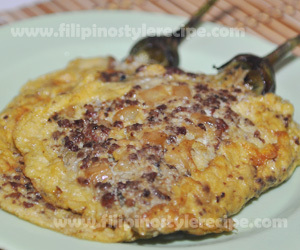 Filipino Style Recipe: tortang talong with pork giniling or eggplant omelet with ground pork is a simple yet delicious breakfast dish. 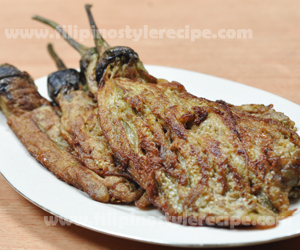 It is consists of broiled eggplants and pork giniling soaked in egg mixture before frying. 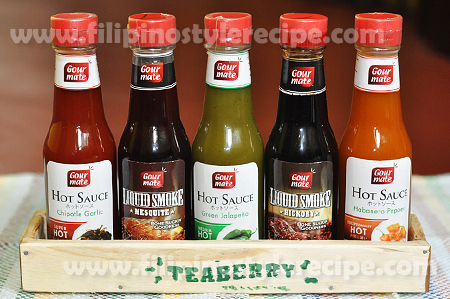 You may also used leftover adobong giniling to take less time for you to prepare this dish. 1. Broil eggplants until skin are charred and blister. 2. Let it cool then peel off the skin and retain the crown and the stem. 3. In a large plate, flatten the eggplant using fork. 5. Pour over eggplants then soak for awhile. Set aside. 2. Add pork giniling until brown then season with soy sauce, vinegar, salt and pepper according to taste. 3. In a separate bowl, beat the remaining eggs then add pork giniling. Mix well. 1. In a pan, heat oil and place eggplant(soaked in eggs) then scoop and pour the pork giniling(mixed in eggs). 2. Fry until both sides are golden brown then drain on paper towels. Serve with ketchup. 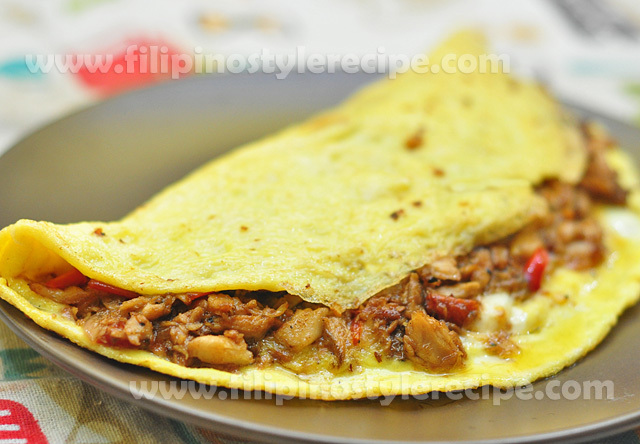 Filipino Style Recipe: tortang giniling or ground meat omelette is another type of Filipino omelette that is usually served during breakfast. This dish is so easy to prepare wherein the ground meat stir cooked in potatoes and carrots. Mixed the mixture with beaten egg and then fry until done. I used longganisa meat to give the sweet taste and more flavorful in our dish. 2. Add ground meat, simmer until tender. 4. Add veggies, soy sauce, salt and pepper then stir cook for 5 minutes or until tender. Set aside. 1. In a bowl, combine ground meat, beaten eggs and grated cheese. Mix well. 2. In a pan, heat cooking oil and pour about 1/4 cup of the mixture. 3. Fry each sides for about 1-2 minutes or until done. Drain on paper towels. 4. 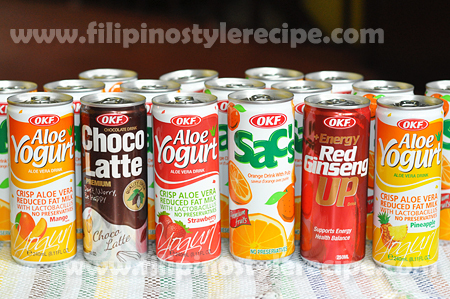 Repeat until the entire mixture is consumed. 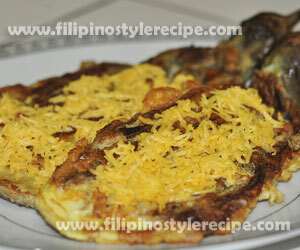 Filipino Style Recipe: tortang talong with cheese or eggplant omelet with cheese is an easy healthy breakfast recipe. It is consists of broiled eggplants then peel off the skin. Stuffed with shanghai mix and dip in egg mixture before frying. Lastly, sprinkle with grated cheese melt before serving hot. 1. In a bowl, combine eggs, flour, salt and pepper. Mix well. 2. In a large plate, flatten the eggplant using fork. 3. Spread the shanghai mix on top then pour the egg mix. 1. In a pan, heat oil and fry eggplant(dipped in egg mixture) until both sides are golden brown. 2. Drain on paper towels then top with cheese. Serve and enjoy. 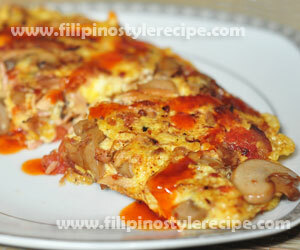 Filipino Style Recipe: tortang talong or eggplant omelet recipe is an easy healthy breakfast recipe. It is consists of broiled eggplants then peel off the skin and dip in egg mixture before frying. 1. In a large plate, flatten the eggplant using fork. 2. In a bowl, beat the eggs and season with salt and pepper. Mix well. 3. Dip each eggplant one at a time into egg mixture. Drain on paper towels. Serve. 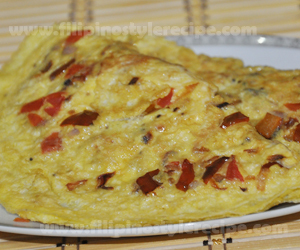 Filipino Style Recipe: Vegetable Omelet recipe is an easy healthy breakfast recipe. Instead of going with the usual eggs and cheese, add a little bit milk and extra vegetables. In a bowl, beat the eggs and milk together until frothy. Season with salt and ground pepper. Set aside. 2. Saute mushrooms for 2 minutes or until nice and browned. 3. Add onion, tomato and bell pepper, continue sauteing until softened. 1. Pour egg mixture into vegetables, Sprinkle with grated cheese. 2. Cook until bottom is golden. Gently fold omelet over. 3. Carefully slide omelet onto a serving plate. Garnish with parsley. 1. You may include 1/2 small zucchini sliced thinly in omelet filling.